The story of adventure play in the UK is very much a London story. 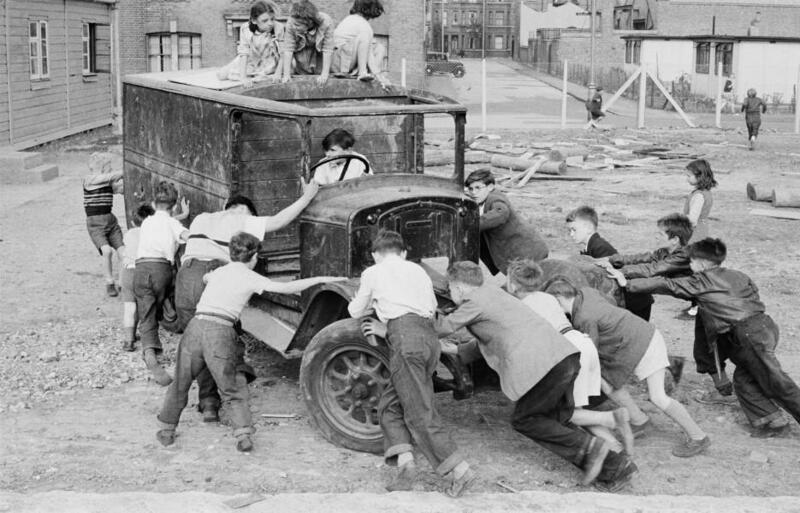 London is the spiritual home of adventure play in the UK – the place where the concept of ‘junk playgrounds’ arrived from Denmark courtesy of the landscape architect and children’s rights campaigner, Lady Allen of Hurtwood, in the years following World War II. 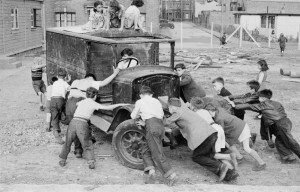 In the early 1950s several more permanent Adventure Playgrounds were established ­one in Crawley in 1954; Grimsby and Lollard Street, Lambeth in 1955; Liverpool in1956; all started entirely by voluntary effort, the last two being supported by the National Playing Fields Association. 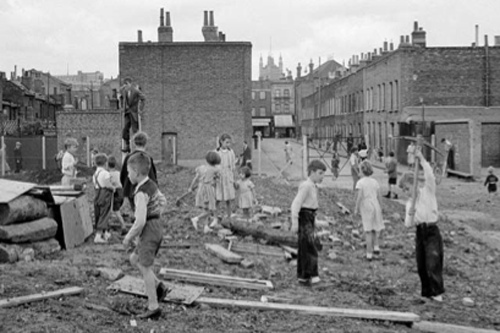 Gradually the concept took root in Britain, and more Adventure Playgrounds were set up. At first they were generally initiated by determined individuals, but increasingly they came to be distinguished by the close involvement of the local communities that they served. 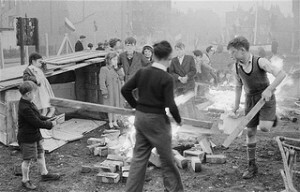 Local Adventure Playground Associations were set up and local management committees were formed. 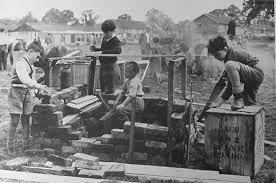 Lady Allen of Hurtwood always stressed that unlike conventional playgrounds they should not be concreted over: it was essential to have plenty of bare earth on which to dig, build and muck about. Indeed, the huge wooden constructions erected by staff and kids together out of builder’s yard scrap and planted deep in the ground have become their trademark. These homemade structures are a combination of tree-house, walkways, and enormous slides, festooned with nets, ropes, swings, old rubber tyres, and often dazzlingly painted: ambitious, imaginative, and fun. 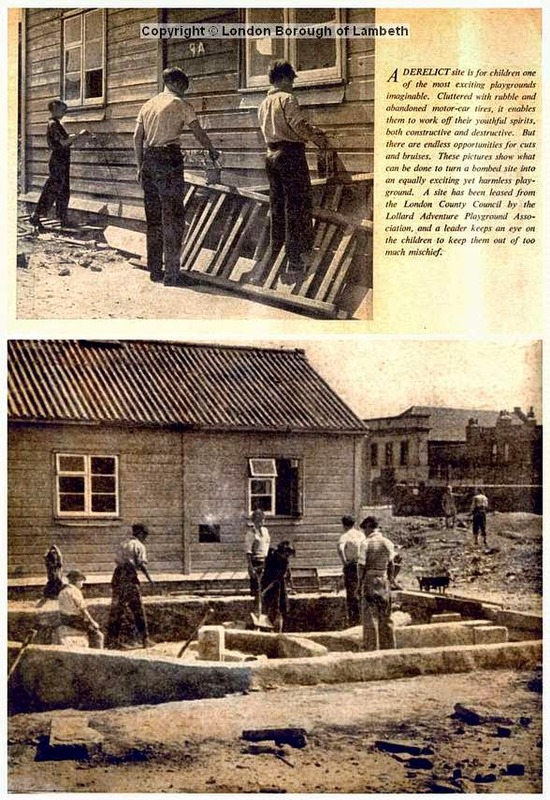 The very first playground, Lollard Street, in Lambeth, started with little more than a workman’s wooden hut. But gradually playgrounds have acquired bigger and better buildings, an area of hardstanding for ball games, and variations of their own. Large swathes of London are levelled during the Blitz. 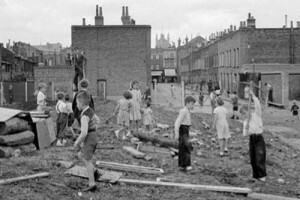 Despite the death and destruction all around, as children in war torn areas across the globe do, London’s youngsters discover thrilling new playgrounds among the ruins. During the Nazi occupation of Denmark, Emdrup becomes the first city to open a playground based on Sorenson’s ideas. Filled with ‘junk’ including wood, tyres, bricks, rope and old furniture and vehicles, nothing in the playground is static or expensive. John Bertelsen is the first ‘play worker’. In response to the increased interest in the junk playground movement, Drummond Abernethy is appointed as secretary of a new Playground Committee within the National Playing Fields Association (NPFA), later to become Fields in Trust. Lady Allen suggests that junk playgrounds are renamed ‘adventure playgrounds’. The UK’s second junk playground opens on a former bombsite in North Kensington’s Clydesdale Road. Lady Allen is a member of the committee. In February the Handicapped Adventure Playground Association (HAPA) opens the first adventure playground for disabled children, in Chelsea. By now there are about 100 adventure playgrounds in London – the Sunday Times produces a colour supplement with a picture of ‘the ideal adventure playground’. Adventure Playgrounds: an introduction is published by the National Playing Fields Association (now Fields in Trust). The first (and last) of an intended series of booklets, it is still relevant today. London Play launches the inaugural London Adventure Playground of the Year Awards – won by Dog Kennel Hill AP. Somerford Grove Adventure Playground is opened in Haringey, north London. The first new playground to be built in London for many years. 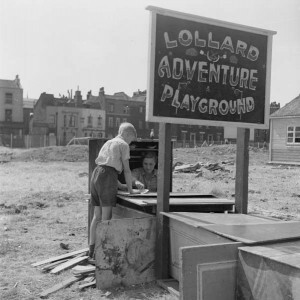 History of Lollard Street Adventure Playground. Image and Text (C) London Borough of Lambeth, (c)2003-2013. “Lollard Street Adventure Playground. 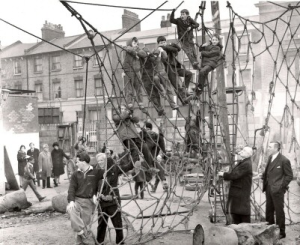 In 1955 a joint initiative from the LCC, Lambeth Borough, the National Playing Fields Association and the local community helped to set up this enterprise, converting a derelict bombsite into an adventure playground for children of all ages. This view shows the Lollard St Adventure Playground Association and a leader keep an eye on the children, who are involved in converting the site into a playground.” More information from the Lambeth Archives. Following cuts to government funding which meant that Lambeth Council was unable to run the playground themselves, Lollard Street Adventure Playground re-opened under the management of the Kennington Association on October 25th 2013. Since then the playground has been developed into a thriving adventure playground providing a place for the local children and young people to play again. Through the hard work of fundraising the playground has managed to keep open through these tough times and is aiming to establish itself as high quality play provision that will be around for another 50 years and more.